This makeover has been on the cards for a while, and there's even been a community initiative to get feedback from users during the process. The new app instantly brings Feedly in line with modern Android UI practises, and looks a lot better for it (unless you really hate white). Probably the first thing many will notice is the removal of gray from the header and nav bar — it's all white now. Once you've gotten over that, you'll see that headlines are now left-aligned while images now appear on the right. As we've seen in lots of recent Android app overhauls, there are now bottom tabs for easier navigation, and the hard to reach hamburger menu icon is now located in the bottom left. Just as before, you can edit the layout to suit your needs (above) with a few new options depending on how busy you want it to look. The default settings definitely encourage you to have empty space. Left: Old vs new sliding menu. Right: The new settings. The sliding menu has been reorganized to remove the items now in the bottom tabs, and your account info is at the bottom out of the way. The custom sharing menu has been swapped out for Android's own (less than stellar) version. Settings have a much simpler look as well, all fitting onto one page and expanding only when you need them to. There's probably one thing you're dying to know, with all that white in front of you... is there a dark mode? As you might have already noticed from the screens above, the answer is yes (just as with the old version) so it's safe to read at night. A couple of other things to note: the little icon in the top left is a sort of progress bar that expands to show you how much time you've spent reading and how many articles, plus the main app icon is now of the adaptive variety. 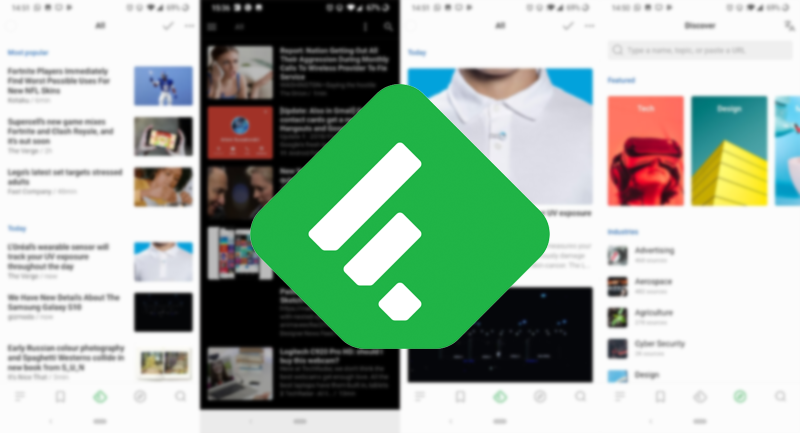 If you prefer the old version, don't fear; the devs already considered that and added a separate Feedly Classic listing so you can keep using it. If you want to try the fresh new design, you can sign up for the beta via the Play Store or just download it directly from APK Mirror. Feedly pushed the redesign, including its lovely new dark theme, out to stable just yesterday. You no longer need take the not-really-adventurous risk of joining the beta testing program to use the new layout. You can download the latest stable release at both the Play Store and APK Mirror.